I gave this book 3.5 stars. It was a surprisingly quick and easy read. I had a good time reading it and I'm excited to continue on in the series. While it's not the best, I still thought it had a great atmosphere and characters that I could relate to. I was most surprised that I read this book quickly because I read it pretty much right after ACOWAR and I had no hitches. No book hangover. This is a very pleasant surprise. I'm glad that this book was here to save me from the dreaded book hangover. It was refreshing to see the main character going to this new school and not instantly becoming friends with the outcasts and shunning the popular girls. Sometimes people do befriend the popular people. Have you ever seen Mean Girls? It happens. It was nice to see that these "mean girls" had redeeming qualities, they weren't completely terrible, they were just raised a certain way. They too had their own set of problems and the main character could see this and didn't just categorize them right off the bat. She gave them a chance. I love books set in the time of corsets and gothic boarding schools, but I sometimes forget the things that always annoy me about them. Like the misogyny. I know that's a must in pretty much any book set before the 21st century and even still now, but every time I have to read about it I get really passionate, I should say. I could totally feel for Pippa and being forced into an arranged marriage by her parents to a guy more than twice her age. The very idea makes me queasy. Every time Gemma let's one of her friends walk all over her I just want to shake her. It's honestly not even that far off from what most teenagers would do, I know I've let myself get peer pressured in the past. I just feel like Gemma getting peer pressured will lead to some terrible things that she may not be able to take back. Especially with Felicity. She's very power hungry. I can already predict that she will be used by Circe. I like Felicity, she's not all bad, it just feels like she's going down a dark and dangerous path. I think the author did a fantastic job of displaying the setting. It felt right, the language, the society, the way the characters were treated and how they reacted. I think it was executed very well. Sometimes when writing during different time periods, authors seem to forget when they are writing in. 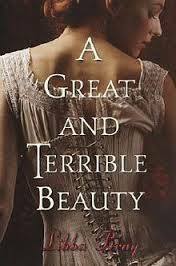 They give their characters corsets and topmast and then they are done with it, so it was good to see that the author put more thought into it than that. Overall, it was a great book, I'm really looking forward to reading the next book and finding out what happens to all these characters in the future.